UPDATE 2017 – This extension is now out of commission as it was only temporary until the Booth Street Bridge was completed. Unfortunately the Booth Strret Bridge has awful bike infrastructure. Promises have been made to improve them. 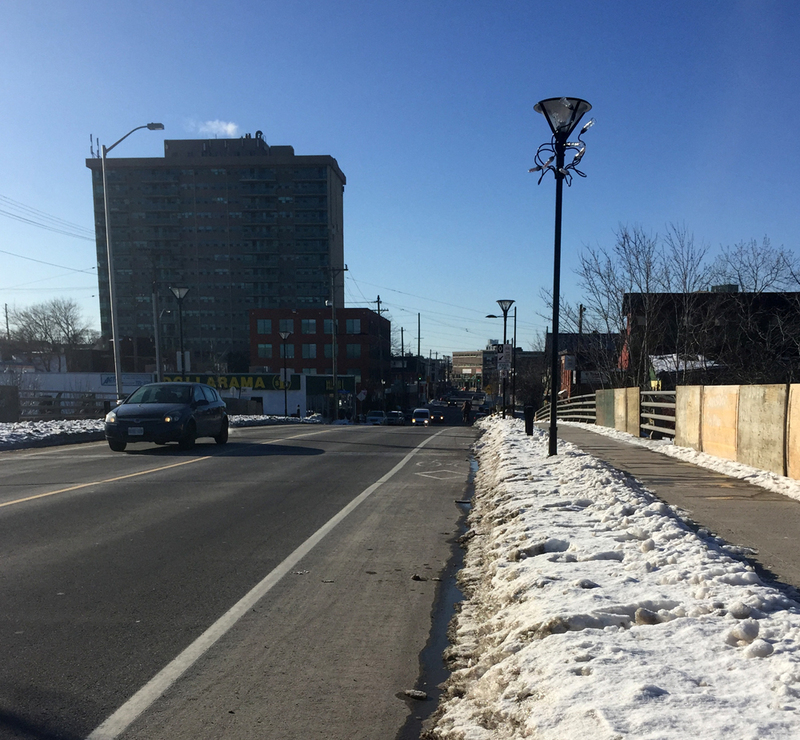 Preston Street has been extended between Albert Street and the Sir John A Macdonald (SJAM) Parkway. That’s because Booth Street north of Albert will be closed for two years while they build the Light Rail Transit. 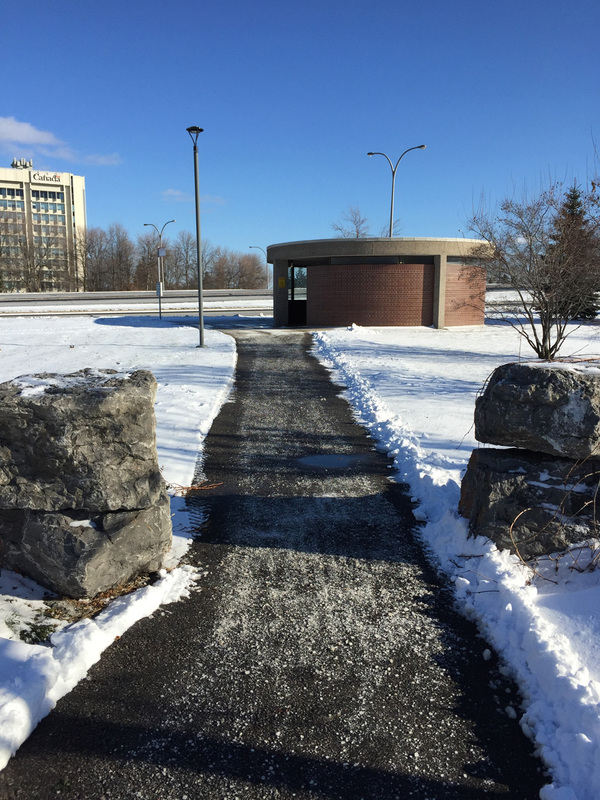 The new extension of Preston includes a multi-use path which will provide winter bike access to the Canadian War Museum. This is an improvement as the section of Booth it is replacing was treacherous to ride along even in the best of snowless conditions. 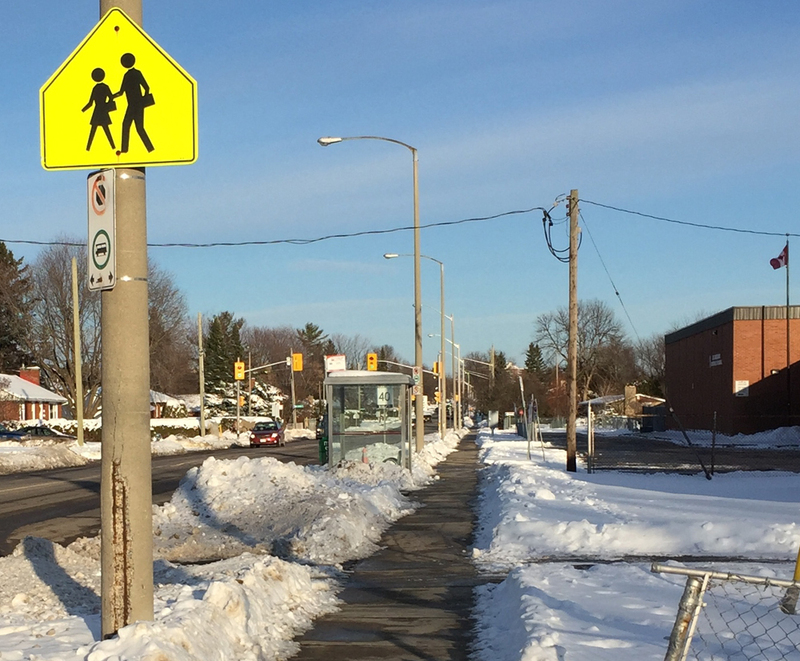 Because this shared pathway also provides pedestrian access to bus stops along it’s length, I am confident it will be cleared all winter (to be confirmed after the next big snowfall). Today I went and tried it out. Blue line is my ride there, orange line is the way I should have gone to get to the start of the extension, and purple line is the way I rode back to access the Laurier Bike Lane. I approached from the south along Preston starting at Primrose Avenue. I chose Preston because Albert is very dangerous to cross or ride along and there are traffic lights where Preston and Albert intersect. Preston has always been a busy street and promises to become more so now that it is a main north/south artery towards the Chaudière Bridge over to Gatineau. 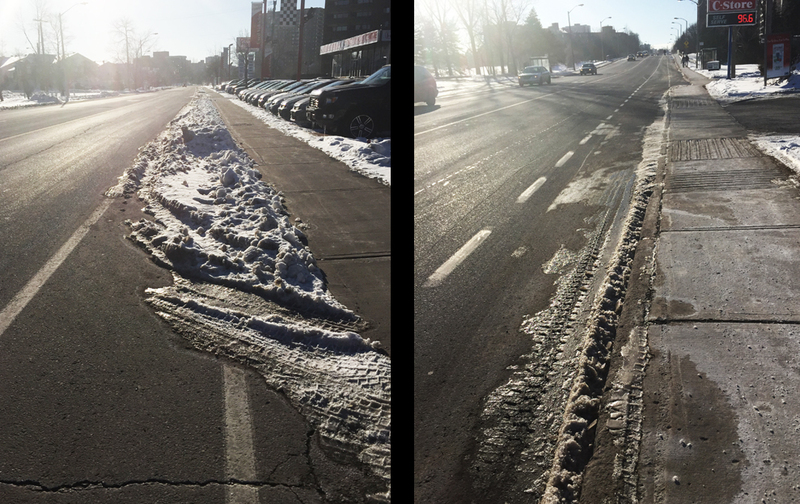 Apart from the new extension, there are no bike lanes along the length of Preston, which in the winter becomes even narrower with the snow, so I took to the sidewalk for the block between Primrose and Albert. In retrospect I should have taken the cleared O-train path under Albert and accessed the sidewalk on the north side of Albert, as suggested by the orange line on the above map. There’s a short section of sidewalk to follow heading east before it joins the path that runs along the north side of Albert. The new extension and multi-use path begins on the north side of Albert. The paths weave behind bus shelters located along the path. 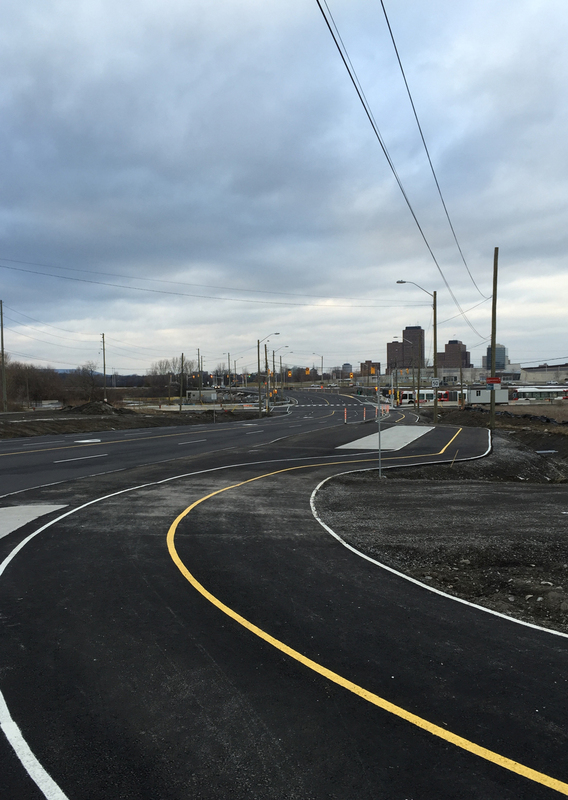 Getting across the SJAM Parkway intersection to the museum first requires crossing to the west side of Preston. The SJAM consists of multiple lanes of speeding traffic, and Preston has a large merging turn on to SJAM. This creates the type of intersection where drivers anxiously rush the light as they transition from one busy street to the other. I had to make eye contact with a driver before he halted suddenly and let me cross, even though there are multiple no-right-on-red signs. 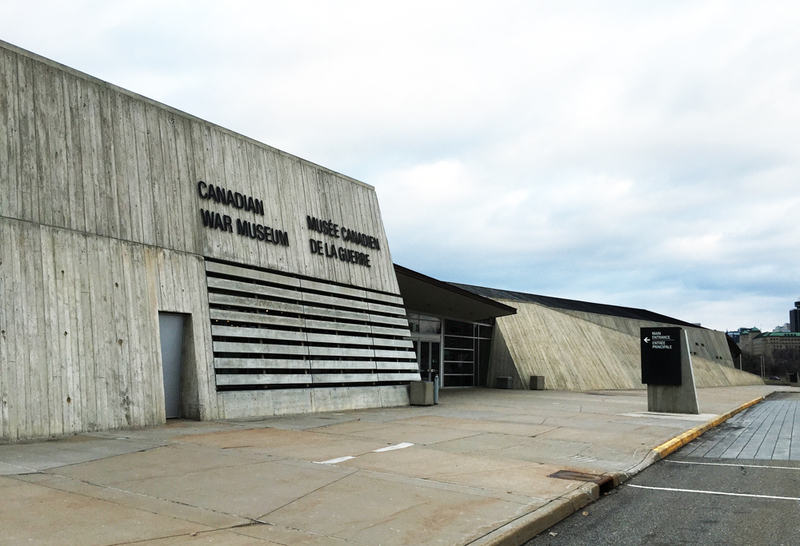 Once arrived safely on the other side of SJAM I rode along the quiet service road to the entrance to the museum. On my return trip, after taking the new path back to Preston and Albert, I continued east along the path on the north side of Albert. It ends at the corner of Commissioners St and Albert. 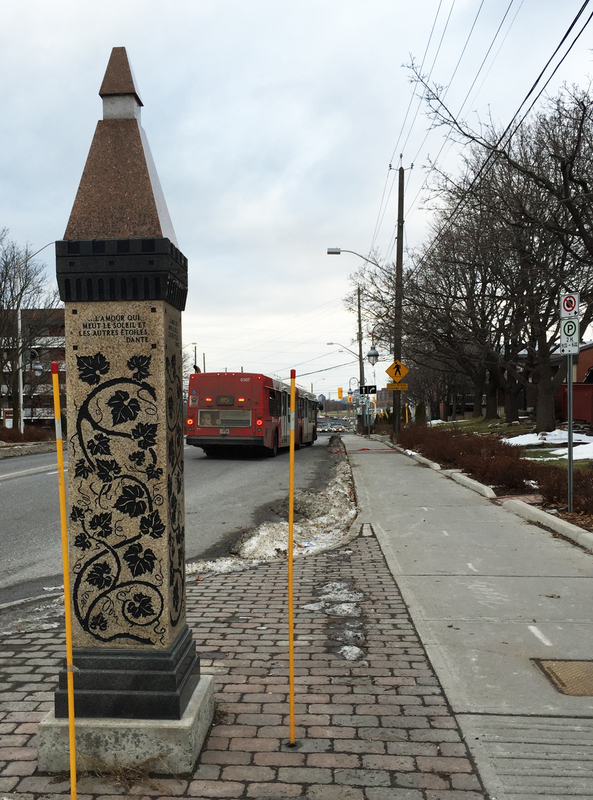 Plans are afoot to introduce multi-use path links between Albert and the Laurier Bike Lane, as described here. Until such time the best way to get to the Laurier Bike Lane is to push your bike up the side walk on the west side of Bronson. 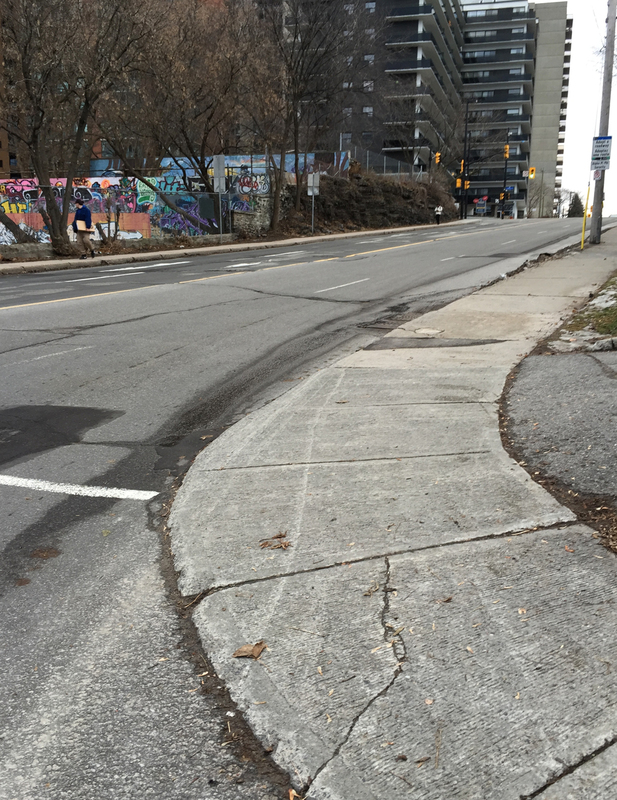 Unless traffic is very light, I suggest taking to the sidewalk not only because it’s a steep little hill up to Laurier, but cars really roar around the corner and up the hill, often clipping the edge of the sidewalk at the corner of Slater and Bronson. 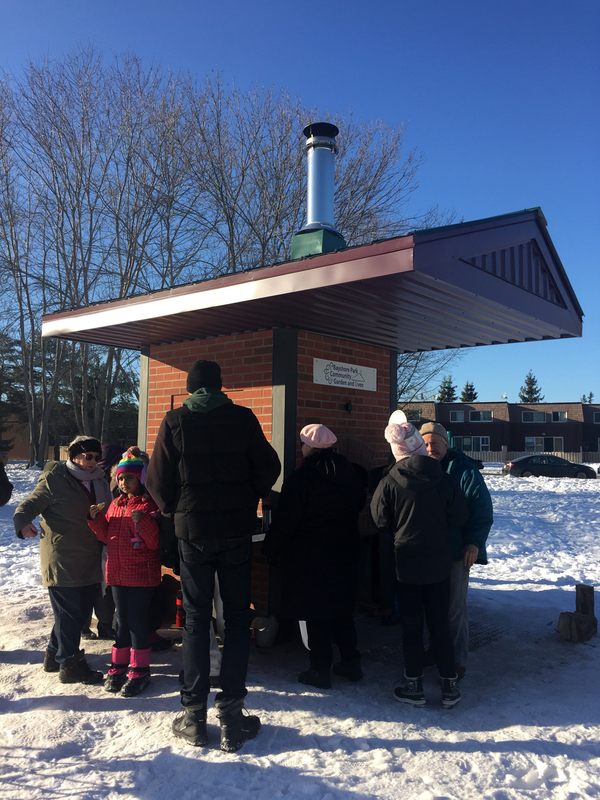 Members of the community surrounding Bayshore Park came up with a great idea – to build a brick oven for people to come together and cook. 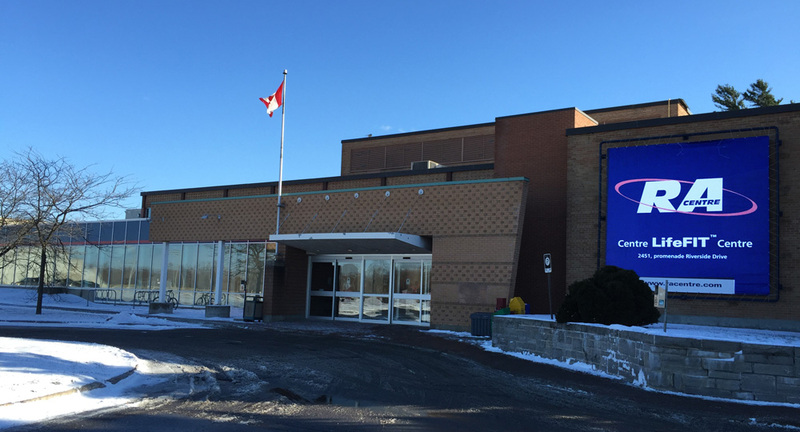 The city has a Better Neighbourhoods Program to help support such initiatives. On Saturday I packed up some prepared bun dough and biked over to the park to attend one of their scheduled oven lightings, and it was fantastic. The blue line on the map below describes the route I followed to get there. Purple lines are deviations I took on the way back. 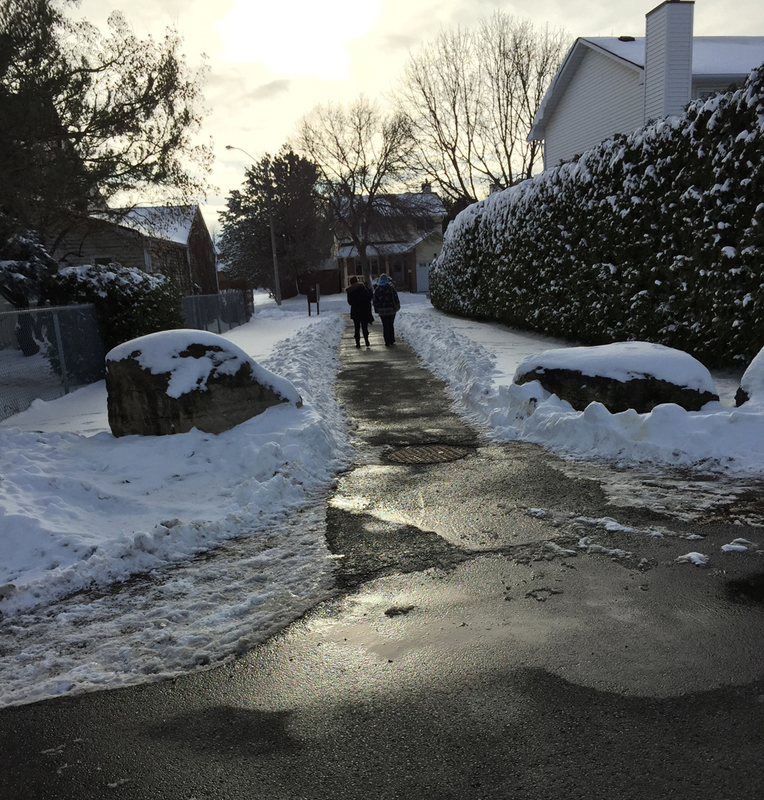 Our adventure begins at the base of the hill leading up from the O-Train path to Somerset St, both of which are cleared of snow! If anyone needs a bike route to get to this starting point, send me your cross street and I would be pleased to figure it out. I crossed Somerset and followed the cleared bike lane to the west side of the bridge. UPDATE: On January 5th this bike lane and the one on the opposite side of street were not cleared of snow, and it is uncertain when or if they will be plowed. When they aren’t cleared I take to the sidewalk, as cars tend to speed when heading up and over this bridge. The bike lane ends suddenly on the other side so I took the short set of stairs to the right, down to Breezehill Avenue. I then wove my way along quiet streets through the Hintonburg and Wellington Village neighbourhoods, all the way to the intersection of Scott Street and Carleton Avenue where there are lights to safely cross speedy Scott Street. 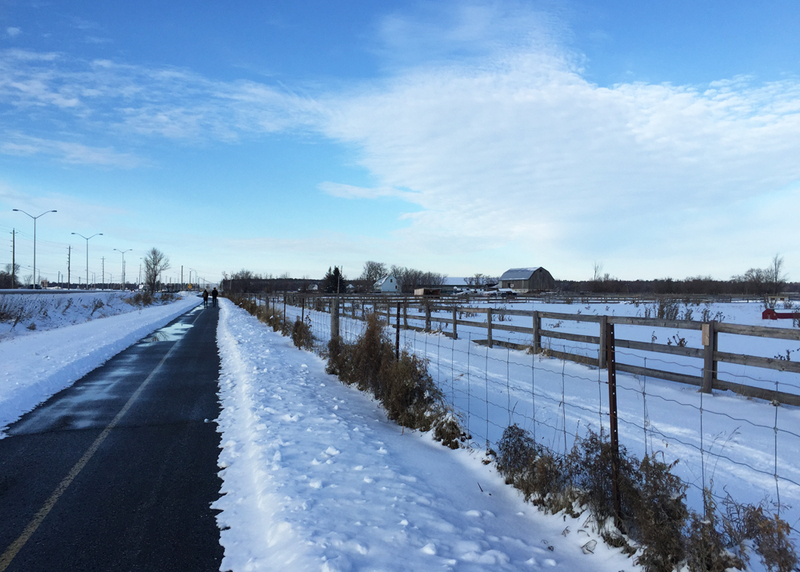 I then followed the cleared multi-use path that runs along the north side of Scott. The path continues to be cleared beyond Churchill where Scott ends, as far the parkway along the river. 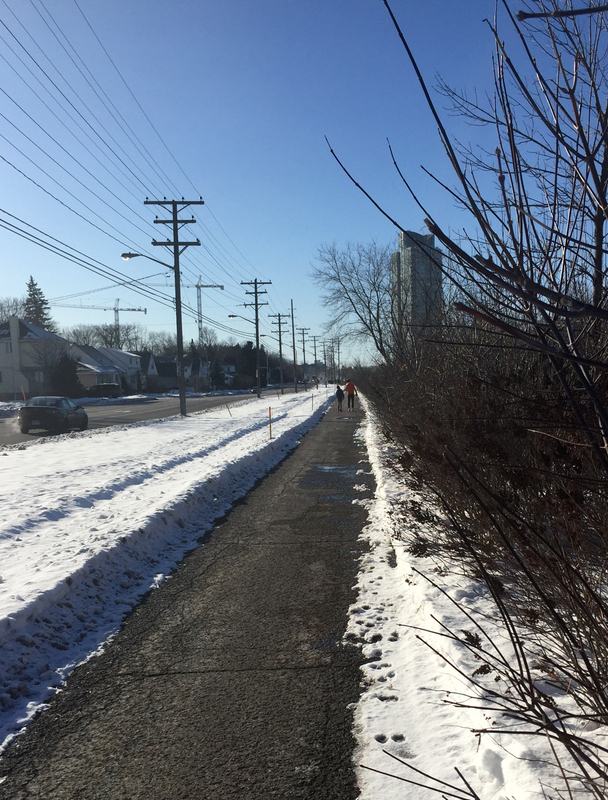 The path that runs along the south side of the parkway isn’t cleared, however there is a very well trampled desire-line path to Fraser Avenue that was easy to follow, especially with my studded front tire. I biked up quiet Fraser and across Richmond road at the lights to access the multi-use path that runs between Richmond and Byron all the way to New Orchard Avenue. I crossed back over to the north side of Richmond at New Orchard Avenue where there are traffic lights. 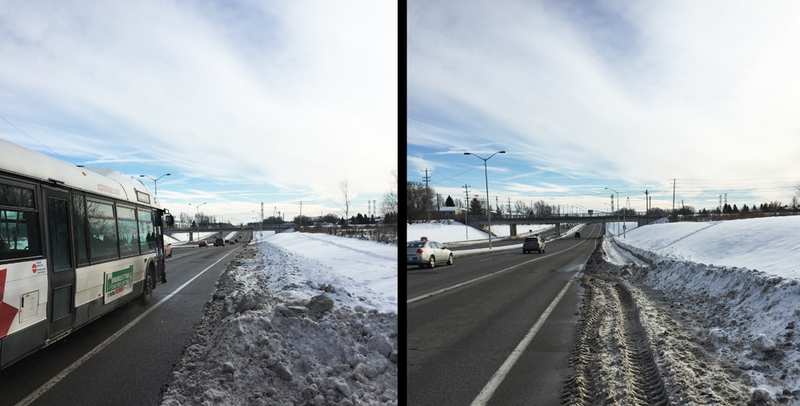 The bike lane heading west along Richmond starts at New Orchard, however the level of snow clearing varied. Between New Orchard and the bridge it wasn’t great, however the lane heading over the bridge was cleared. Once over the bridge I turned onto Regina Lane that runs parallel to Richmond for a short spell. There’s a great mural part way down the lane. More detailed photos of the work can be found here. 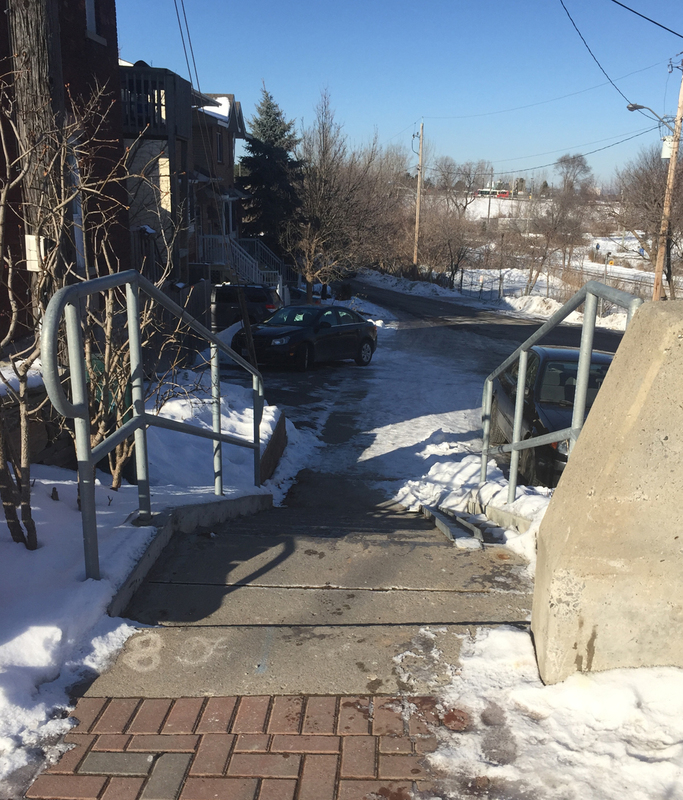 I continued along residential streets through the Lincoln Heights neighbourhood, and took advantage of a small opening in the fence along Greenview Avenue to access Farrow Street. The final challenge was to get to Bayshore Drive without having to ride along busy Carling Avenue. 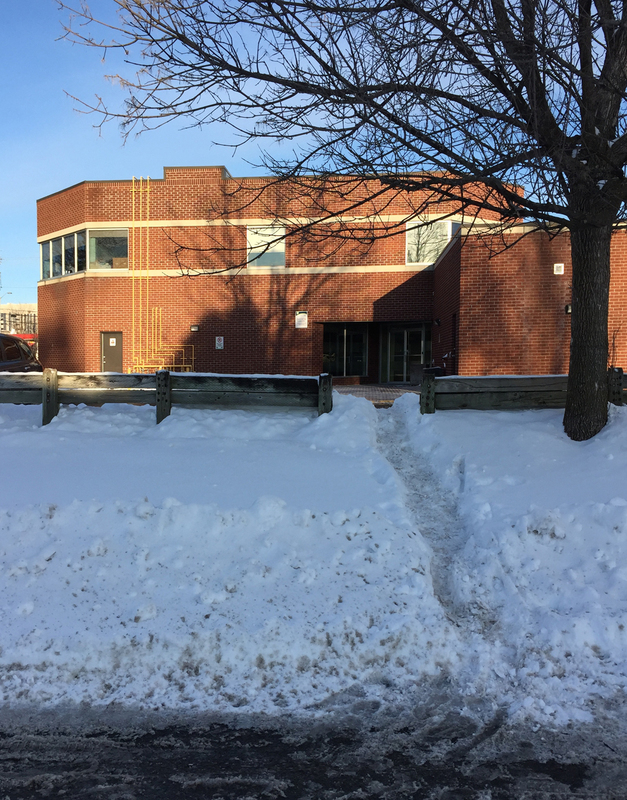 This required following a couple of short, well traversed but not cleared, pedestrian paths between Kempster to Wylie avenue and Oakley to Birchdale avenue. Then it was across Carling to Bayshore Drive, along Woodridge Crescent, and into Bayshore Park where sits the communal oven. When I arrived there were a whole bunch of wonderful people cooking and sharing an assortment of dishes. Tom, the head baker of the day cooked up the little buns I had prepared and they turned out perfect! Everyone was very pleased. 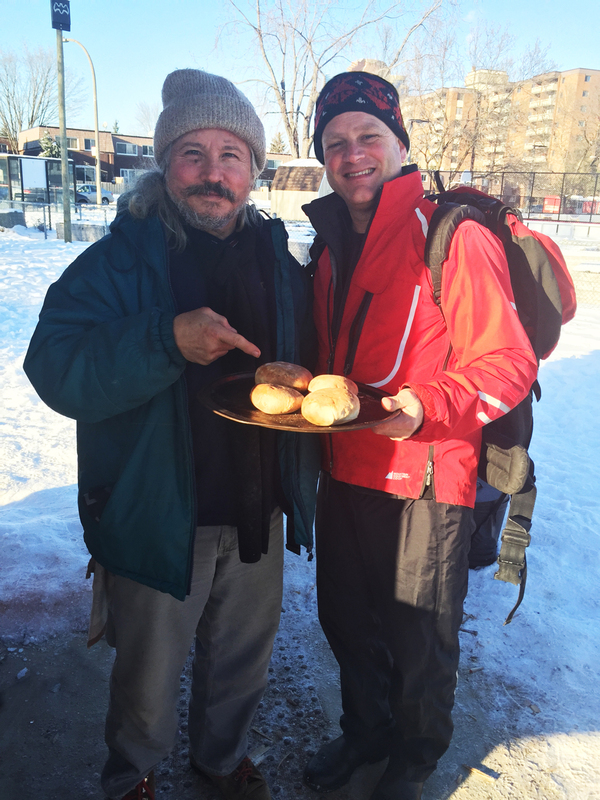 To know more about how the oven came to be check out this CBC interview with John McDougall the oven builder and Mete Pamir, one of the community organizers. They also have a Facebook page with more history. Success! Tom the baker, et les petits pains maison! Time to head home. On the return trip I couldn’t ride back along Regina Lane because it’s a one way heading west. Closer to Centretown, I avoided Breezehill because it’s hard to see cars coming when crossing Bayswater heading east, as the two streets meet on the inside of a curve. Crossing Somerset at the top of the Breezehill stairs to get to the bike lane heading east is a bit tricky as well, as it’s hard to see cars coming over the crest of the bridge. 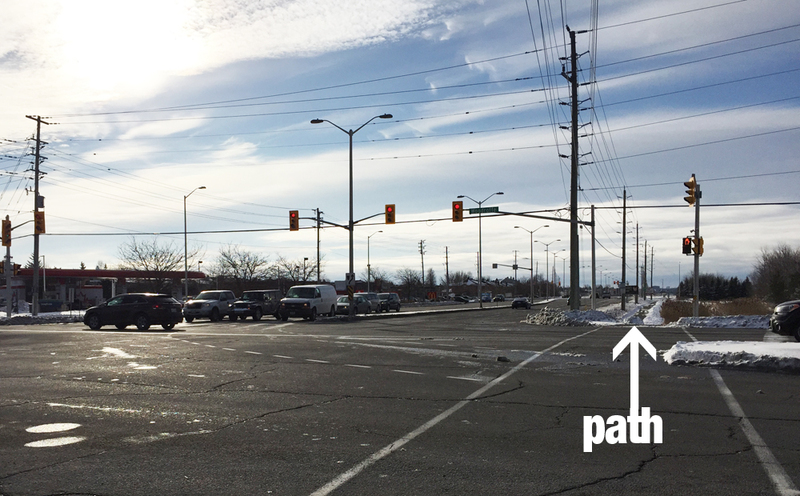 A fellow cyclist is in need of a winter bike commute route from Barrhaven to the corner of Merivale and Baseline. That’s because the bike path along Greenbank which he follows on his summer commute is full of snow. The green line on the map is his regular summer route. Here’s a description of a winter route I plotted and tested a couple of days after this season’s first big snow fall, identified by the blue line on the map. I started from Merivale & Baseline. The purple line is a slight variation I took on the return trip. Our journey begins in the parking lot at the end of Granton Avenue that fronts onto Clyde. Granton is accessible via a short, well trodden path to the left of this photo. I wove my way along quiet residential streets to always-busy Meadowlands Drive. There isn’t a traffic light where Meadowlands intersects Sullivan Avenue, however there is a cross signal half a block east in front of the school which I took advantage of on my return trip as there was no let up in traffic. I also had to use the sidewalks along Meadowlands to get to and from the crosswalk. View of Meadowlands signalled crosswalk in front of St Gregory School seen from Sullivan Ave. I continued down Sullivan and turned west on Novice towards Woodroffe Avenue. The biggest obstacle to commuters heading south of Ottawa are the two sets of east/west railway tracks. It’s a challenge to choose which of the minimal number of places to get across are the safest. On this route the crossing of the first set of tracks happens along the busy six lane Woodroffe underpass. 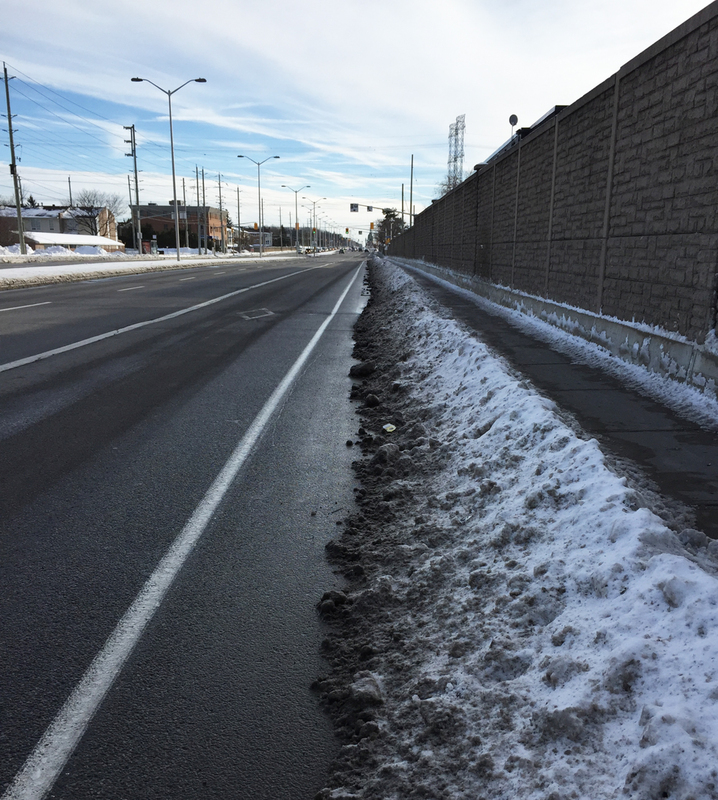 There are bike lanes along Woodroffe, which were mostly cleared, except for one spot heading south where it suddenly was filled with snow for a short stretch. Up until that spot the sidewalk wasn’t cleared, but now it was, thus the snow in the bike lane. There are bus lanes beside the bike lanes and there weren’t any buses coming up behind me so I managed to bike around the short section of snow filled bike lane. If there were buses roaring up behind me I probably would have chosen the sidewalk. 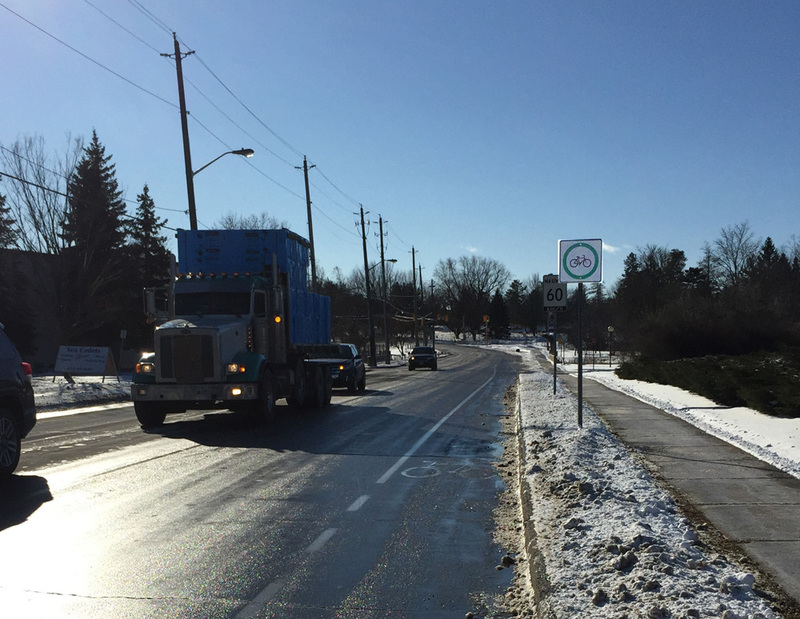 Bike lane along Woodroffe. Cleared most of the way…. then filled for a short stretch. 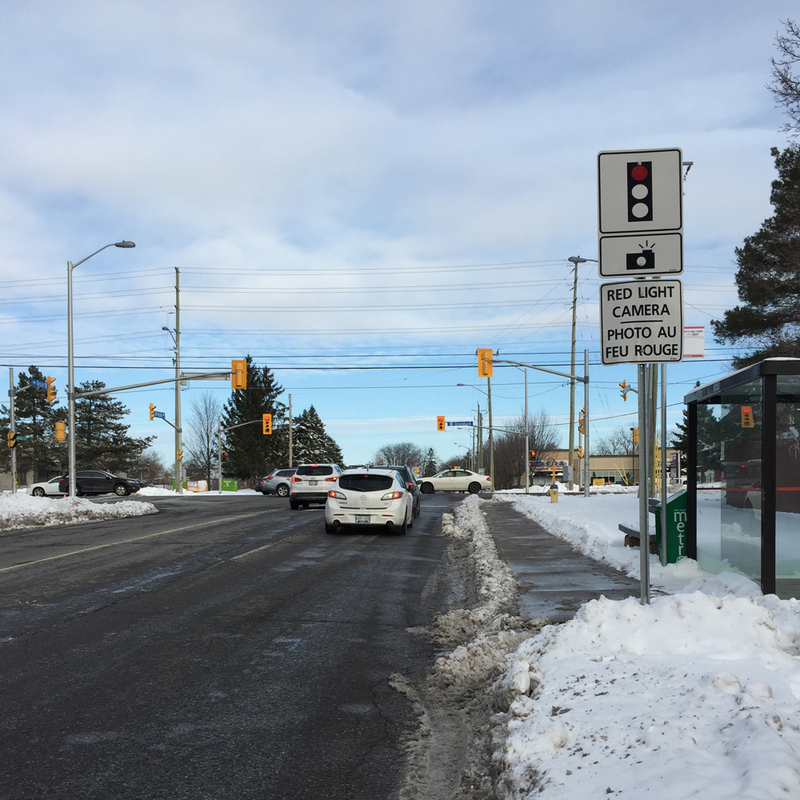 I continued along the Woodroffe bike lane which was mostly cleared, however the crossing at Hunt Club Road was pretty treacherous with six lanes of impatient traffic meeting six other lanes of impatient traffic. I chose to avoid this intersection on the way back (see purple line on map) which I’ll describe in more detail further down the post. 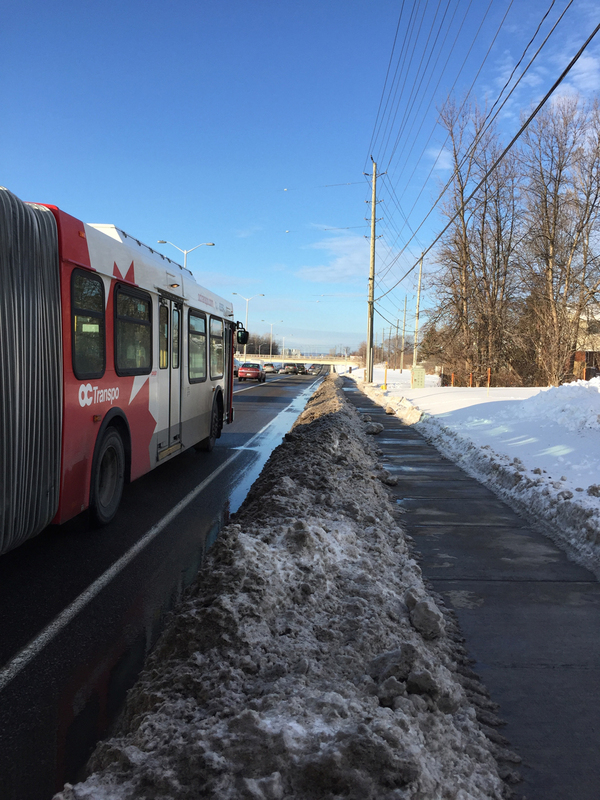 I’ve also been told by a local cyclist that the Woodroffe bike lane between Knoxdale and Hunt Club is often filled with snow due to the limited space between the road and the concrete sound barrier. The purple line detour avoids this as well. 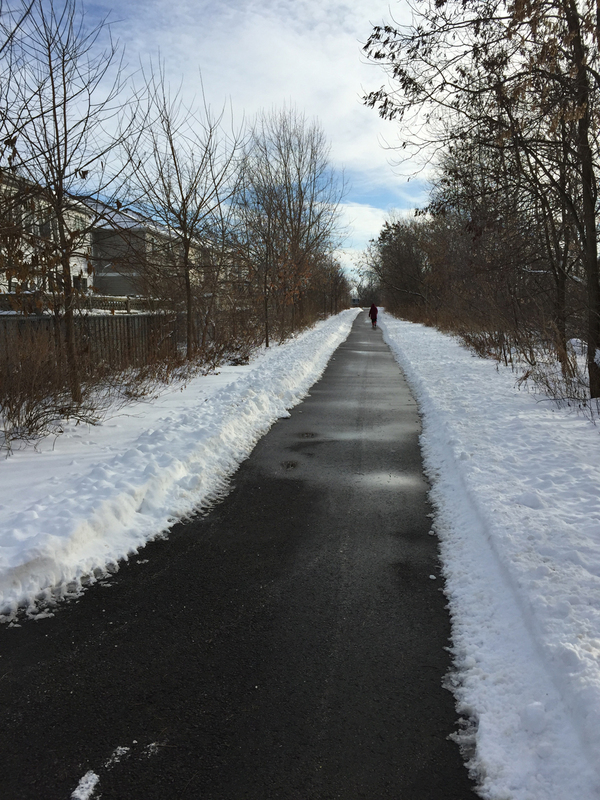 I was pleased to get off of Woodroffe at the entrance to the Nepean Sportsplex, and onto the CLEARED multi-use path that runs along the east side of Woodroffe all the way to Fallowfield Road. And it’s a pretty spectacular ride too. There’s a section that floats through a tall pine wooded area, while the rest is mostly farmland. There’s a bit of an obstacle course where the path crosses the second set of tracks, but it’s very manageable and safe if navigated slowly. 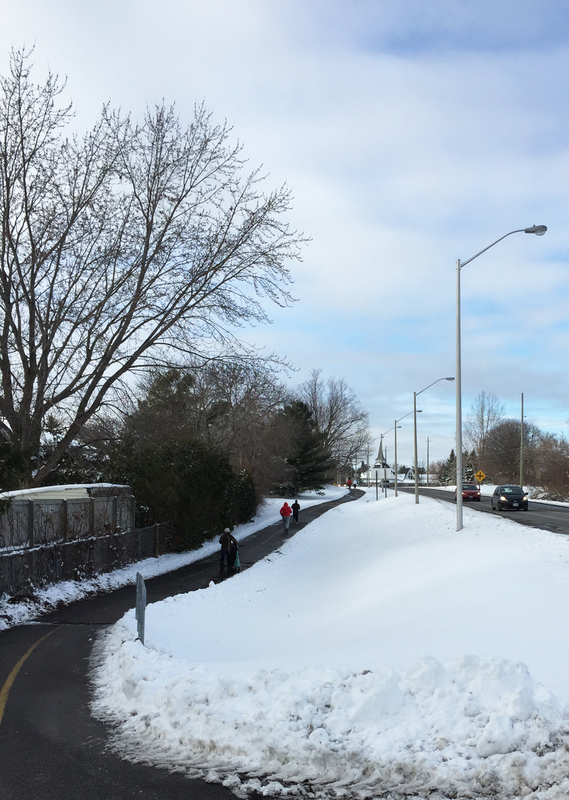 I crossed at the intersection of Woodroffe and Fallowfield over to the cleared bike path that runs along the north side of Fallowfield to Via Park Place. Towards path across Woodroffe along Fallowfield. 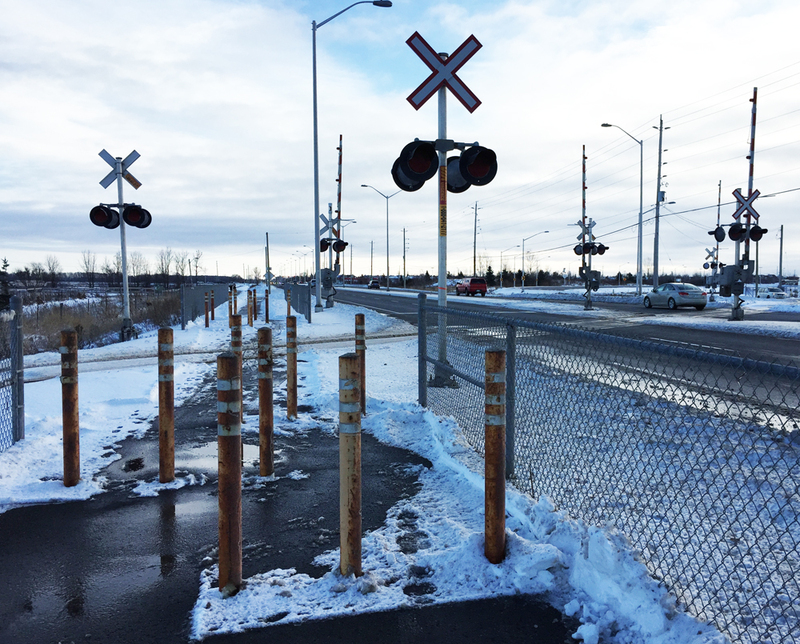 At Via Park Place I crossed at the lights over to the very well cleared path that continues along Fallowfield before veering south alongside the Transitway and train tracks. I got off the path at Berrigan Drive and followed it across Greenbank Road. 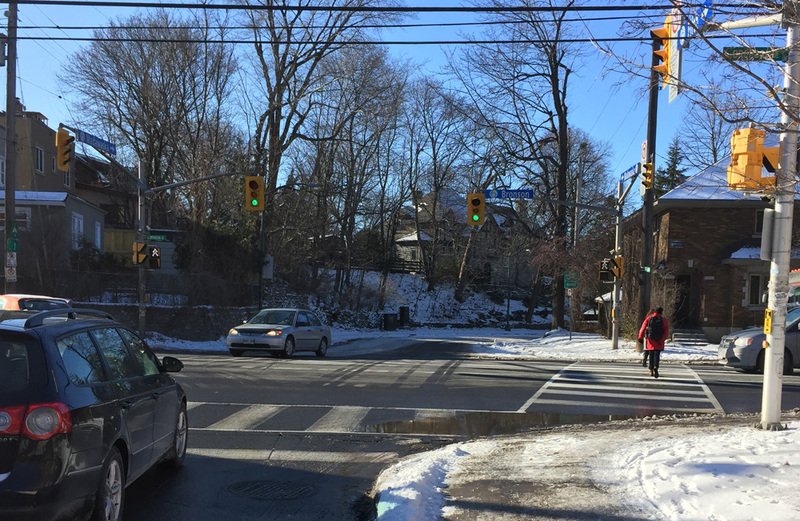 Greenbank is a busy street, and when there are signs warning drivers about a red light camera as you approach, one can imagine what a frantic intersection it promises to be. I didn’t find it too crazy or dangerous, but I did consider the sidewalk. I then rode along Wessex and Exeter Road to the round-about at Jockvale Road. I was very pleased to notice a cleared path running along the south side of Jockvale Road, which I followed over the train tracks. 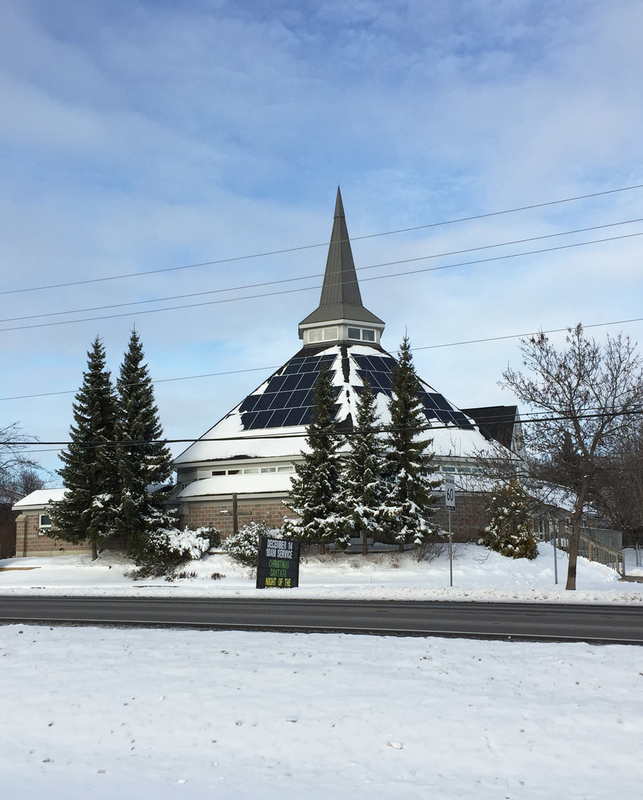 I was impressed to see Barrhaven United Church thriving on another form of heavenly energy – large sections of their roof are covered with solar panels. Not far beyond the train tracks I turned off the path along this short cleared link that brought me to Pickwick Drive. 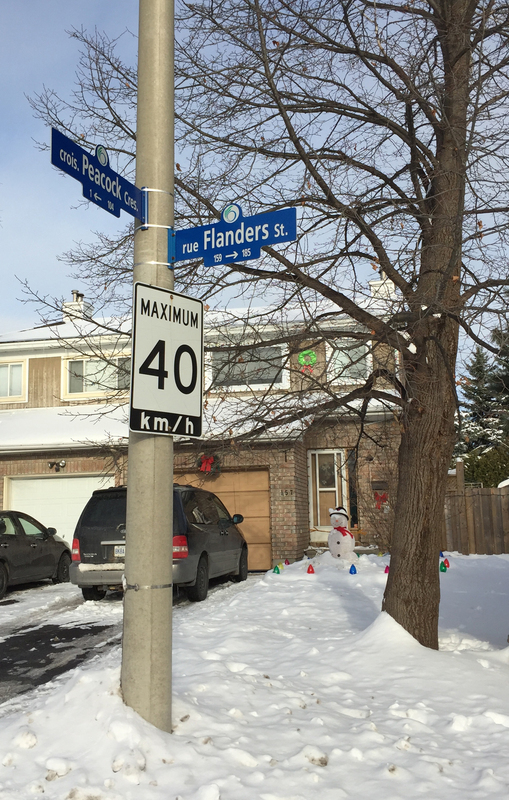 I then wove my way along quiet residential streets to my final destination – the corner of Flanders St and Peacock Crescent, deep in the heart of Barrhaven. Now I had to get back before it got dark! Here’s a view of the farm along the Woodroffe path. Here’s a description of the detour I took to avoid the crazy Woodroffe/Hunt Club intersection (purple line on the above map): I turned onto the path that runs parallel to the entrance to the Nepean Sportsplex. 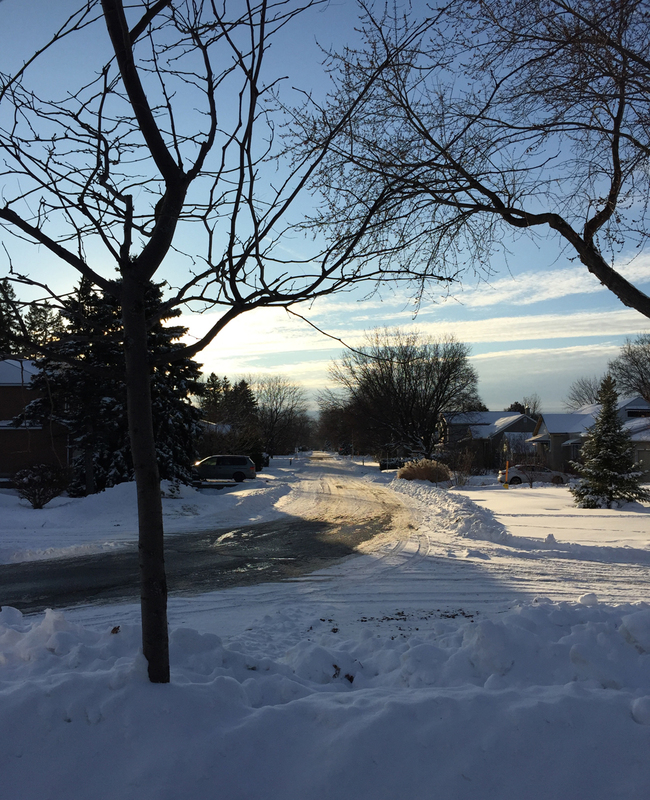 On the left: Looking north along Woodroffe Ave. ………. On the right: The bike path heading in to the Nepean Sportsplex. I chose right. The bike path ends at the edge of the parking lot. 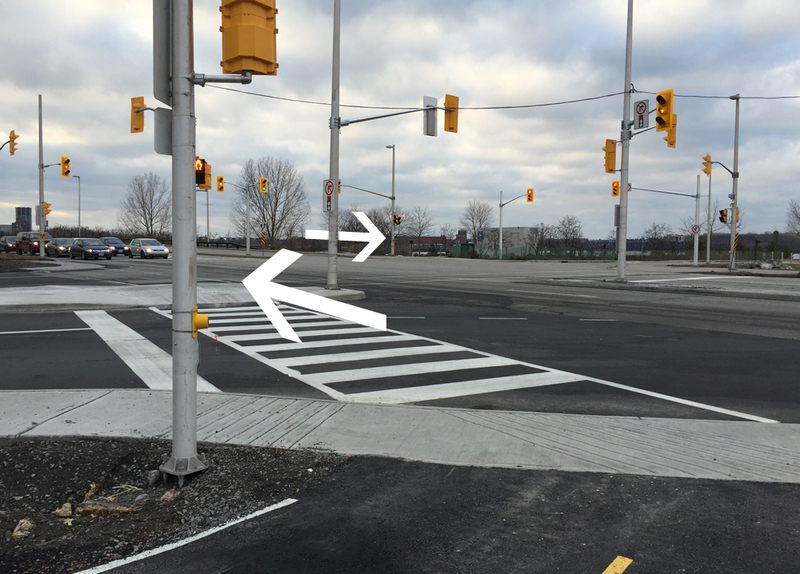 I biked through the expansive lot to the north/east corner where the path continues for a short distance to a signalized crosswalk that is MUCH more civilized than attempting to cross Hunt Club along Woodroffe. I then rode along residential streets, popping out onto Woodroffe at Medhurst Drive. Once again the bike lanes were partially cleared. The sidewalk was completely cleared. Once beyond the train tracks I turned off Woodroffe onto Norice, and retraced my route all the way back to the little path at the end of Granton Avenue that leads to the building at the corner of Baseline and Clyde. Ta-dah! Path at the end of Granton Ave.
A friend was wondering whether there was a safe winter bike route from The Glebe to the RA Centre. There is, as per the map below, but it’s quite circuitous – sadly so, when you consider how physically close the two destinations are from each other. At the time of the RA’s conception, driving was the de facto mode of transpo and, by default, still is. 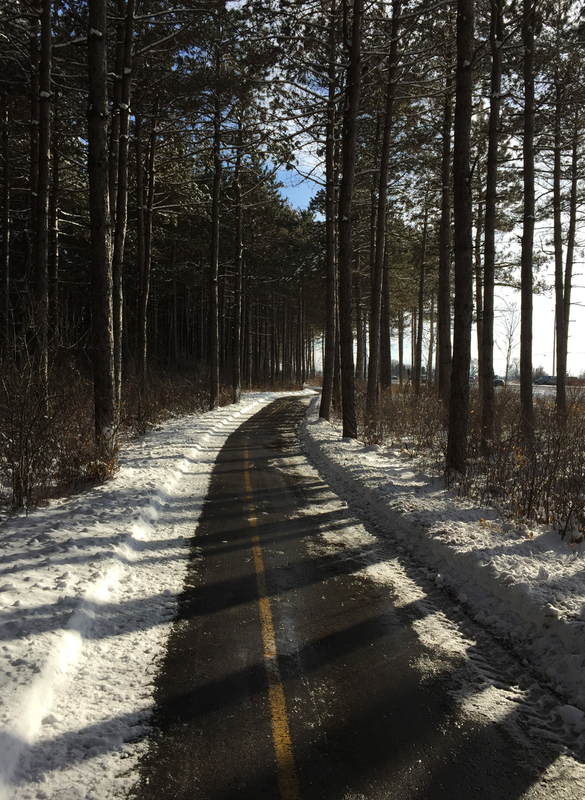 As we wait for the powers-that-be to bring our city’s cycling infrastructure up to par, I suggest the following as the safest winter bike route to get there. I also recommend a studded front tire for winter riding. Winter cycling along Bronson is to be avoided. I crossed Bronson at Fifth Ave where there are traffic lights. The other side of Bronson becomes a pleasant meander along Madawaska Drive to Commissioner’s Park which explodes with tulips come springtime. 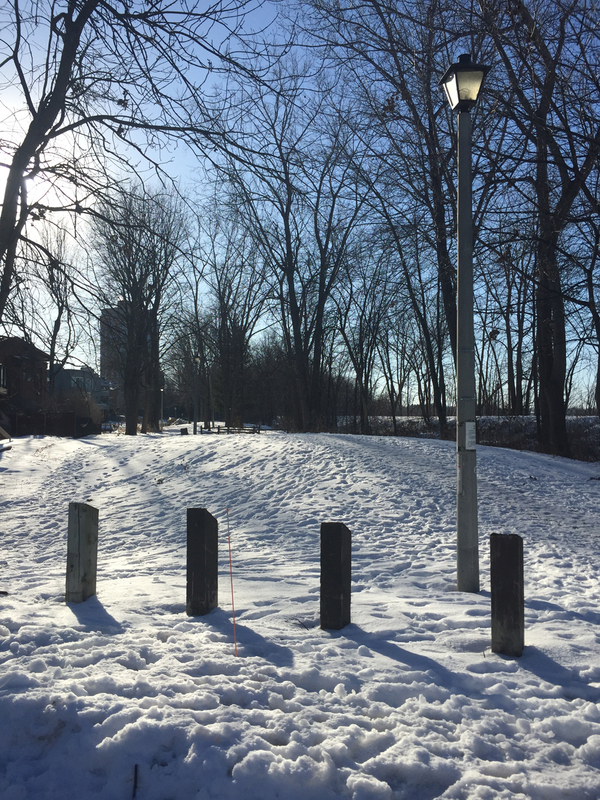 A minimal number of city paths are cleared throughout the winter which often forces one to rely on shared Desire Lines, i.e. trampled down paths popular with pedestrians regardless of whether plowers were instructed to clear them or not. I followed this one that cuts across the park to the edge of the Queen Elizabeth Driveway. This path is proportionally more trampled relative to the skate-ability of the canal. On the other side of the driveway I rode a short distance along the plowed-and-salted Rideau Canal Western Pathway to Preston Street. 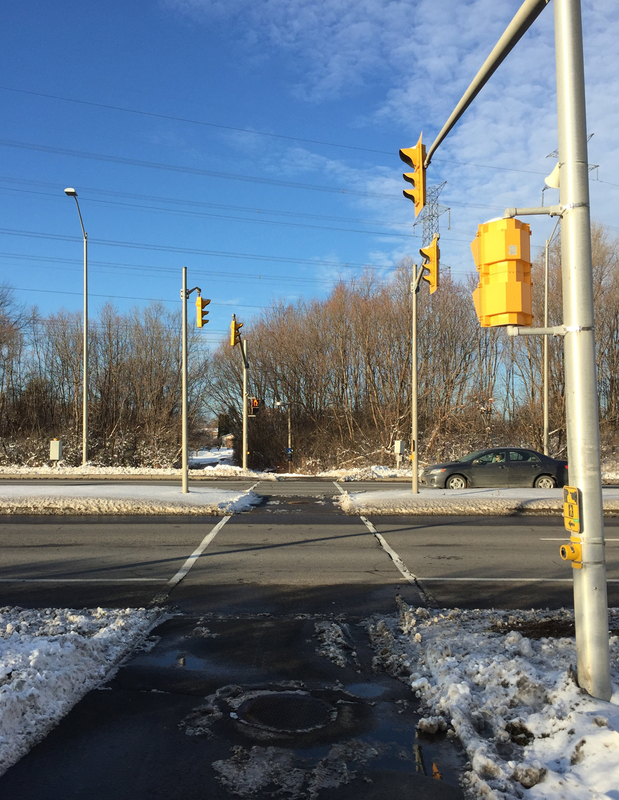 I crossed at the lights to the usually cleared bike lane along Prince of Wales and followed it for a short distance to the lights at the entrance to the Arboretum. 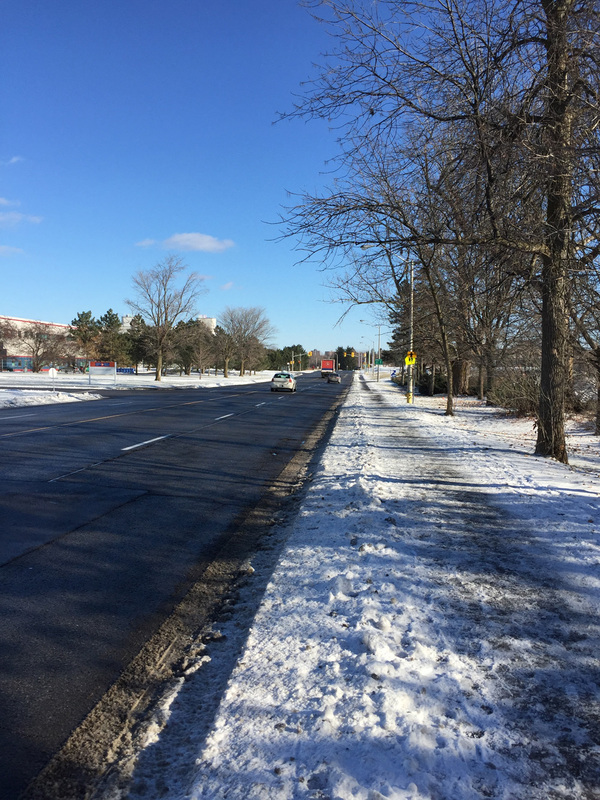 If biking along Prince of Wales seems (understandably) spooky, the sidewalk between Preston and the entrance to the Arboretum is clear, and usually empty. Once safely in the Arboretum I rode along the cleared/not salted path that ends at the bottom of the hill that officially isn’t to be used for toboganning. I then relied on some of winter cyclists best friends – dog walkers! 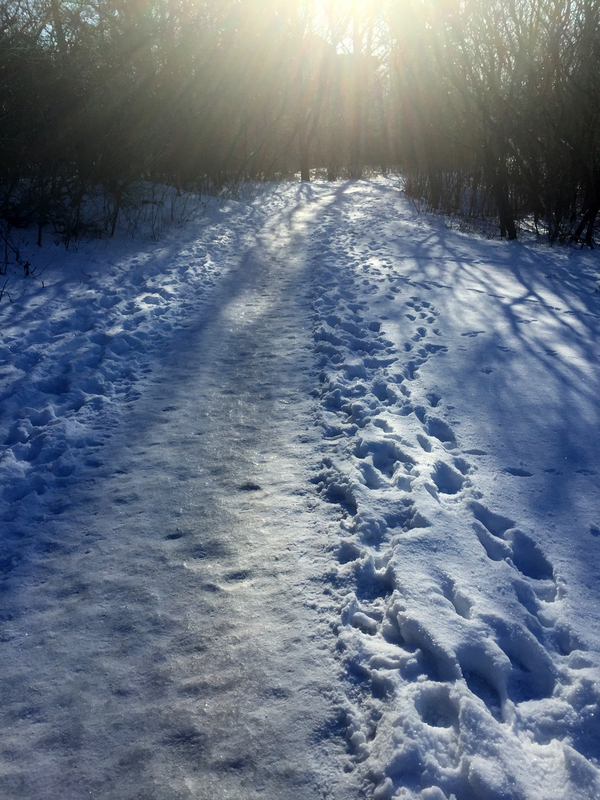 The Arboretum is extremely popular with dog walkers who, within hours of a snow fall, recreate a network of well trampled paths. My destination was the canal locks across from Carleton University which can be traversed 12 months of the year. The paved path along the canal proper isn’t always trampled flat, however there is one that goes up through the Fletcher Wildlife Garden which hi-lites the beauty of Desire Lines. They exist where people want to go. 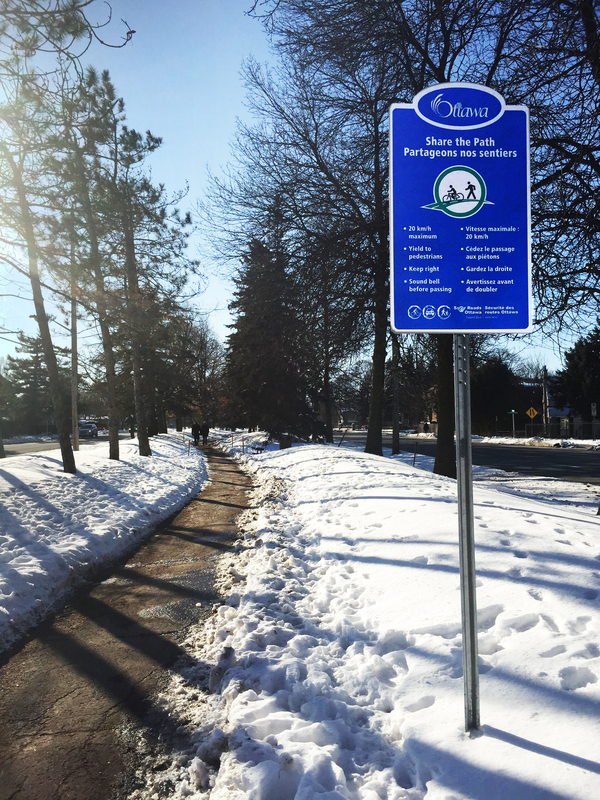 In the winter, dog walkers park in the Fletcher Wildlife Garden parking lot. From there they work their way down through the arboretum, not along the official paved path that hugs the canal, but along the old service road that leads down from the parking lot. Another reason I like to follow this route is the passion the Fletcher Wildlife Garden maintenance crew has for this microcosm of varied natural environments. 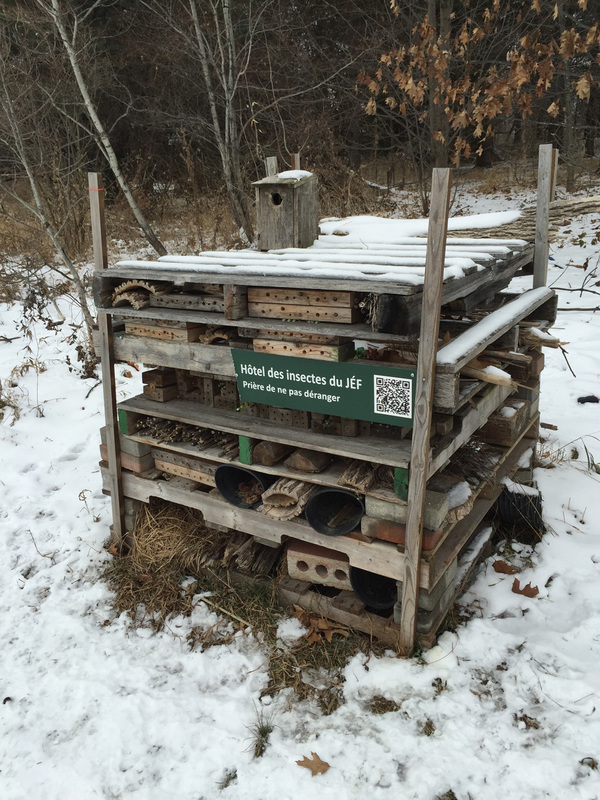 Around every corner along the myriad of intimate paths they have created initiatives that engage visitors to the subtleties of the surrounding natural environment, like this insect hotel. 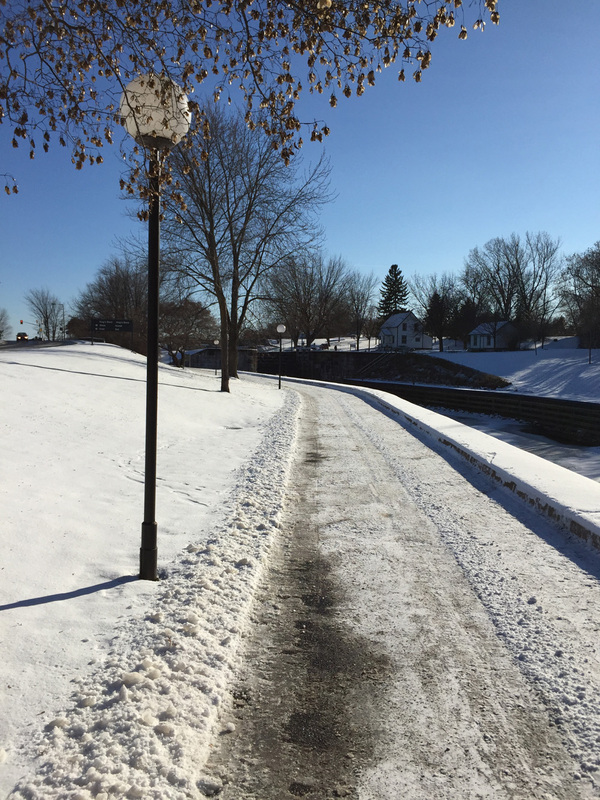 I crossed at the locks and followed the Rideau Canal Eastern Pathway, which is cleared-&-sanded, all the way to Hogs Back. 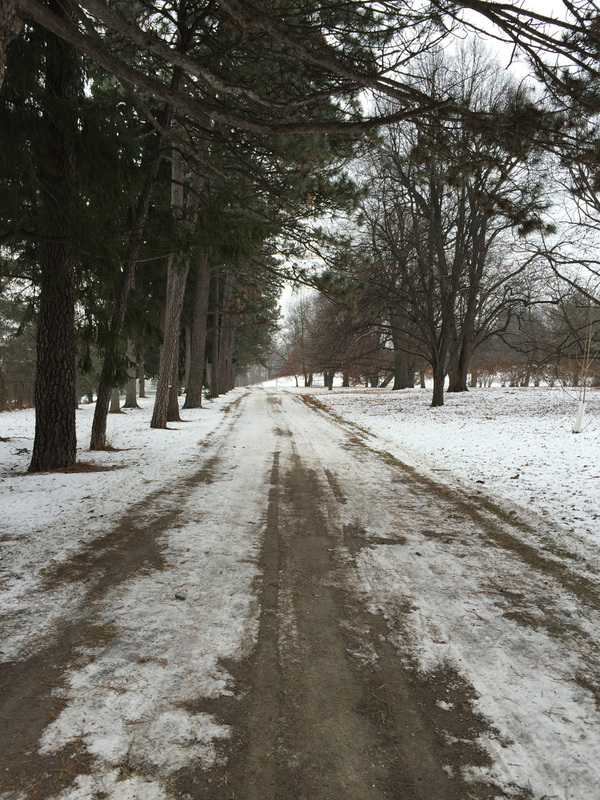 The path up and over the falls is salted as well, as is the path along Hog’s Back Road to Riverside Drive. 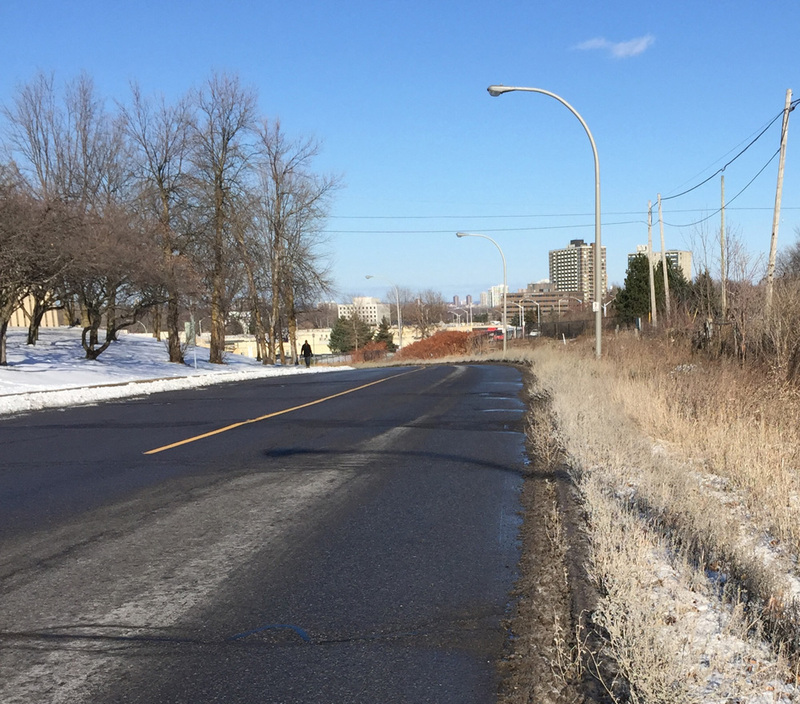 Brookfield Road across Riverside Drive is quite wide and there is usually ample space along the shoulder to ride along even in the winter. 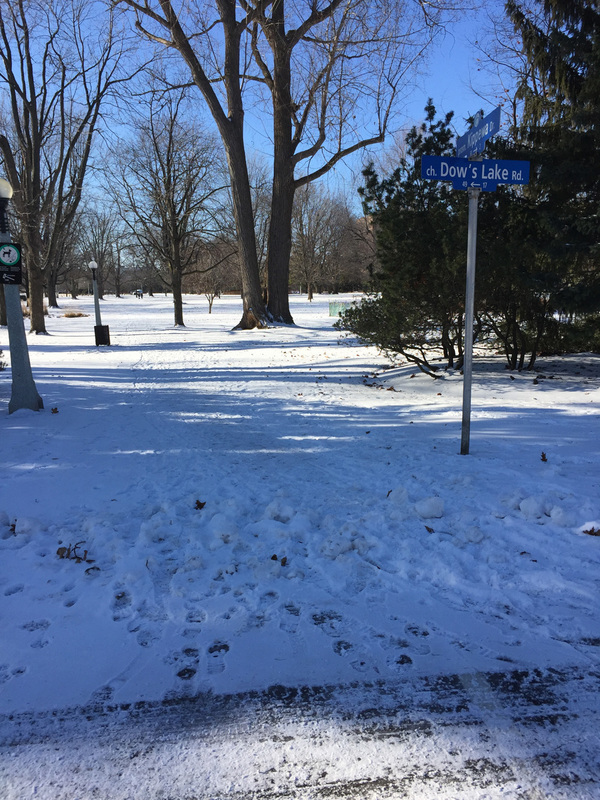 Drivers do tend to speed along this stretch of road, so the option of using the cleared and usually vacant sidewalk is a possibility. 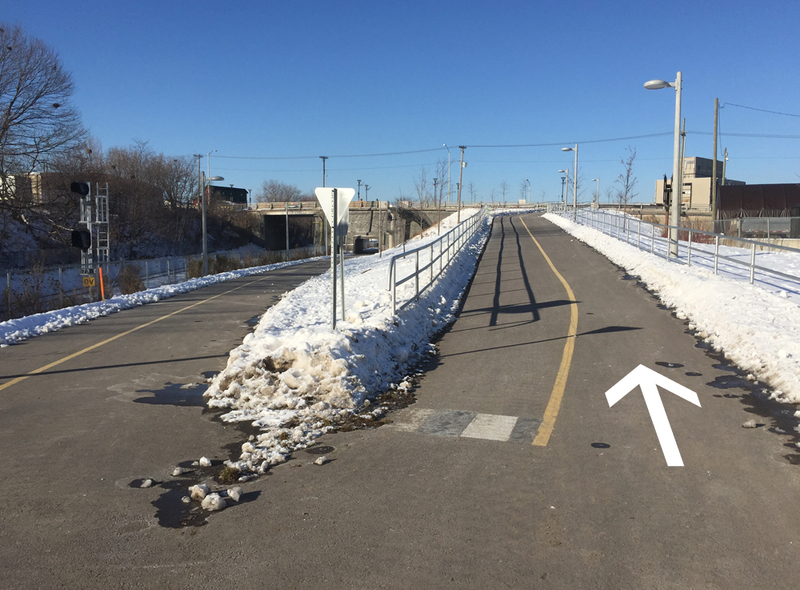 I then crossed at the roundabout over to the cleared & salted path that winds down beside the transit station and up to Heron Road. I then crossed at the lights at Heron, and continued along the equally cleared and salted path behind the Sir Leanord Tilley building. 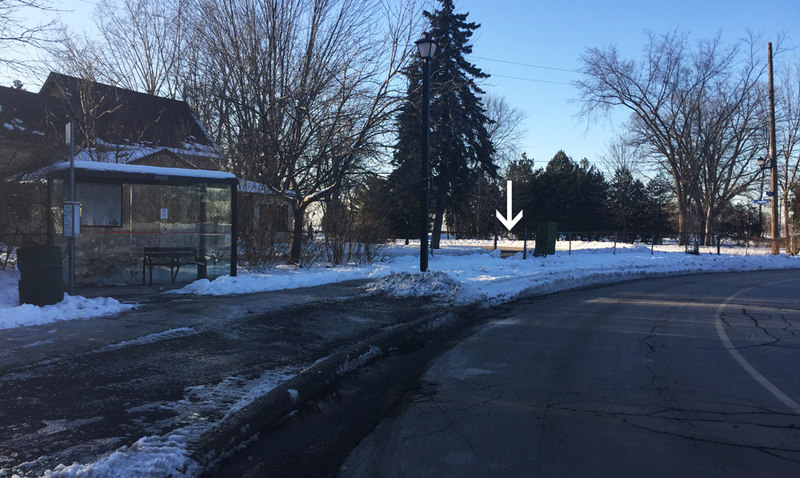 While driving to the airport I’ve often noticed two small pillbox shaped pavilions on either side of Bronson which I assumed to be some sort of utility stations, but are actually access points to an all-season pedestrian tunnel under Bronson. 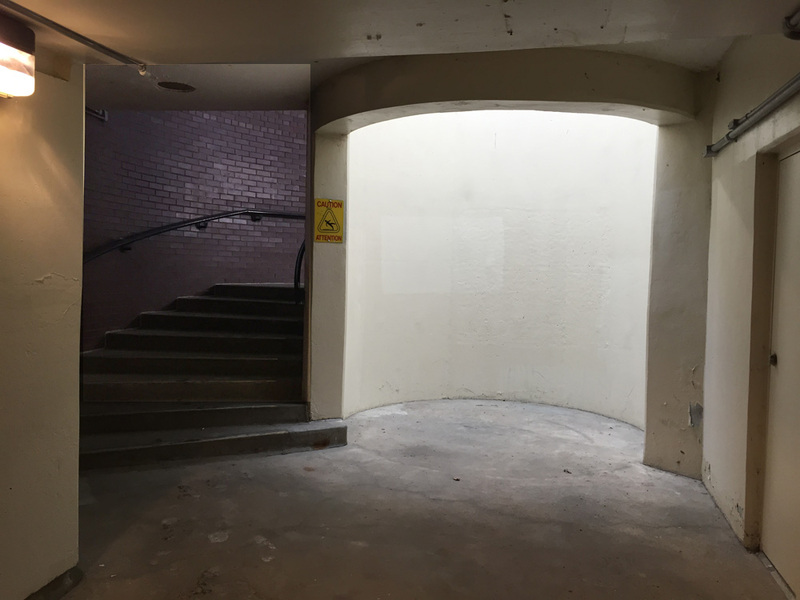 The wide circular stairwell has very shallow steps and ample room to either push or carry ones bike. 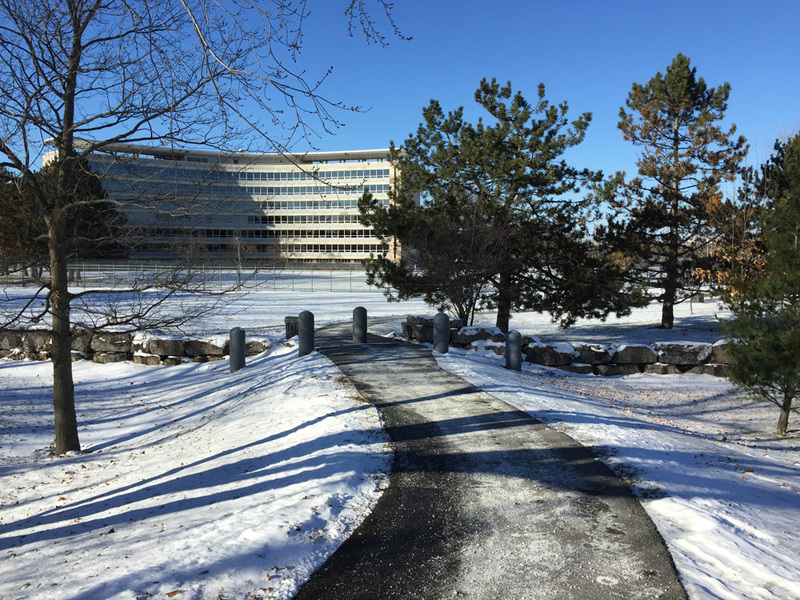 Once on the east side of Bronson, I cut along the salted path towards the tall government buildings. I rode around to the other side through the parking lot and found myself on quiet Data Centre Road, which goes down the hill towards Riverside Drive. Before reaching busy Riverside Drive, there’s a turn to the RA Centre. Crossing the new Airport Parkway Bridge ! 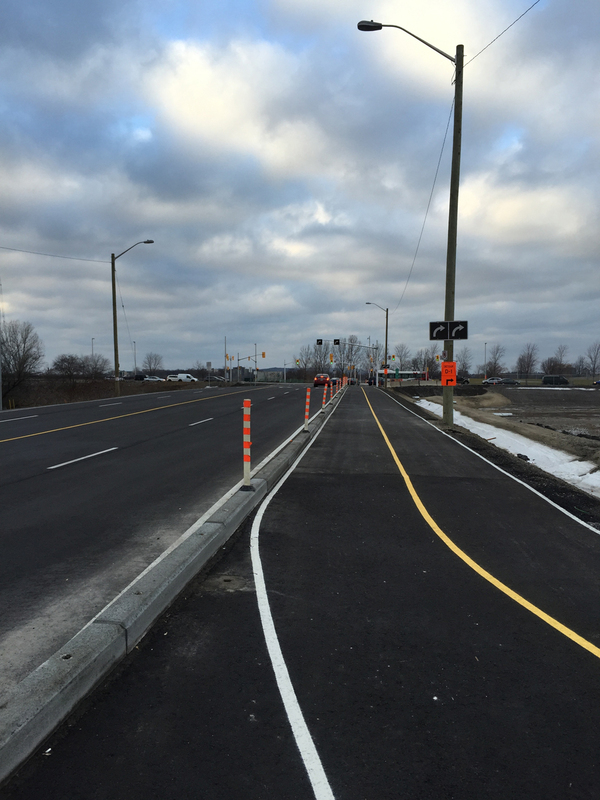 The much anticipated Airport Parkway Bridge officially opened on Saturday, creating a safe pedestrian and cycling link between communities on either side of the busy parkway. 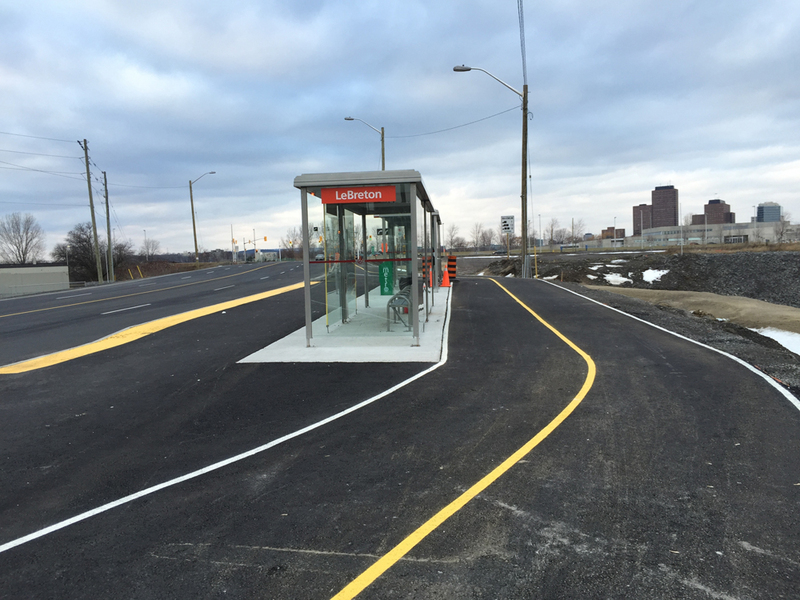 It also now provides cyclists easy access to the Sawmill Creek Pathway and a fine bike commute towards downtown. The blue line on the map below is the route my friend Peter and I followed to get to the bridge starting from the Arboretum. It includes a recently added stretch along the Sawmill Creek Pathway, described in more detail here. Green line is how we got back. The red bit is the bridge. Here’s a video of what it’s like heading east over the bridge. Author ottawaveloPosted on December 1, 2014 Categories Art & Architecture, Ottawa4 Comments on Crossing the new Airport Parkway Bridge !